The first Cars film was a send up to all the road movies of the past. The film dealt with the love America has for the open road; watching the horizon stretch out in front of you, finding those small out of the way towns that remind you of an easier time in your life, and also the loss of that era as modern progress slowly advances throughout the country. As with most Pixar films the movie was a huge success and it was fairly obvious to most that a sequel would find its way to us. Now Cars 2 arrives in theaters to once again transport us into that realm. This time around the story revolves around a World Grand Prix featuring the top racers from around the globe. That is the main story; the secondary story follows our good friend Mater who finds himself in a case of mistaken identity when some spies confuse him for their American contact in Japan. The film sets up the spy plot opening with a sequence on an oil rig where Finn McMissle (Michael Caine) is investigating a message he received claiming there was something sinister going on at an oil rig on the ocean. When Finn makes his way onto the rig he discovers a number of things, a TV camera with the World Grand Prix logo and dozens of lemons (cars that are in constant need of repair). When he tries to radio for help he alerts the lemons who attack him and he barely escapes with his life. Back in Radiator Springs, Lightning McQueen is returning from winning his fourth Piston Cup, which holds special significance for him as this year it was renamed in honor of Doc who has passed away. Lightning is happy to be back and see his friends Mater (Larry the Cable Guy) and Sally (Bonnie Hunt). Lightning's vacation is short lived after some involvement from Mater and they wind up joining the World Grand Prix. Lightning assembles his pit crew including Mater and they all head to Japan for the first leg of the World Grand Prix. While there Mater and Lightning attend a party for all of the racers and after a slight bathroom "mix-up" Mater is confused for the American contact that Finn and his partner Holly Shiftwell (Emily Mortimer) are looking for. It seems one of the sponsors of the race has introduced a highly unstable alternative fuel source to be used by all of the racers and there are certain "enemies" who would love to get their hands on it. Finn and Holly insist Mater help them and Mater being the friendly, gullible type, agrees. While the race continues on Mater tries to convince his friends of what is happening but of course no one believes him. With the race reaching its climax and Lightning longing to prove that he has what it takes to stand up with the greatest racers from across the world; Mater must do everything he can to help his friend before something disastrous happens. In the first Cars movie the message was learning how to slow down and enjoy the simple things in life without losing yourself. This time around instead of rehashing that same theme or plot the makers went for a completely different take focusing more on the action and excitement that only a spy caper can bring. Like with all Pixar films the movie has wonderful blend of child friendly humor without completely alienating its adult audience. And once again the visuals are only better than what we have seen in the past. That is the beauty of animation, it can take you to places you would never expect and at no time does it ever feel completely unreal. What we see happening is totally acceptable within that realm and succeeds in transporting us from our life of routine into another world where the fantastic is possible. Cars 2 does exactly what the creators at Pixar have always done, tell a fun and somewhat poignant story that winds up translating into our lives in ways we would never expect. 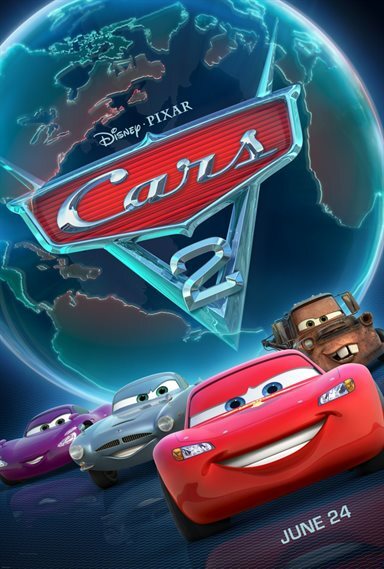 Download Cars 2 from the iTunes Store in Digial HD. For more information about Cars 2 visit the FlickDirect Movie Database.